H. Rick Bamman -hbamman@shawmedia.com McHenry County Chief Deputy Clerk Vern Paddock double checks settings on one of six voting machines on the second floor of the administration building on Ware Rd. in Woodstock. Early voting began on Monday February 27. 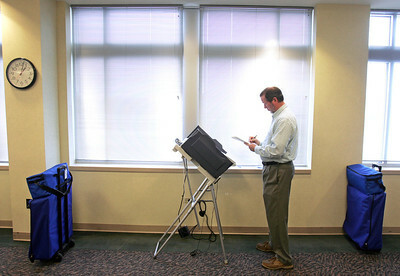 McHenry County Chief Deputy Clerk Vern Paddock double checks settings on one of six voting machines on the second floor of the administration building on Ware Rd. in Woodstock. Early voting began on Monday February 27.